Naughty backyard raccoon, originally uploaded by BigAssSuperBlog. One of a series of pictures snapped past midnight last night as I looked off the back deck and saw a raccoon causing mischief in our backyard. First, it reached up and started tugging at the yellow extension cord that runs from the deck to the shed. 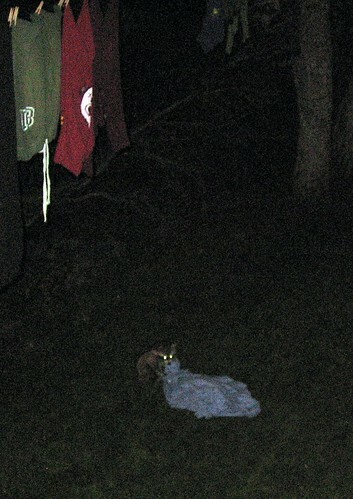 Then it walked over to the clothesline and pulled down a big blue fleece blanket ... and either planned to heist it, or make it a meal. I hustled down the stairs to ask its name, but it scurried off into the neighbour's yard. My kitty seemed intrigued by the smell of the blanket when I brought it inside. I hope it didn't smell like rabies.